Coach David Quinn said the veteran right wing has a groin strain and will be evaluated when the team returns. 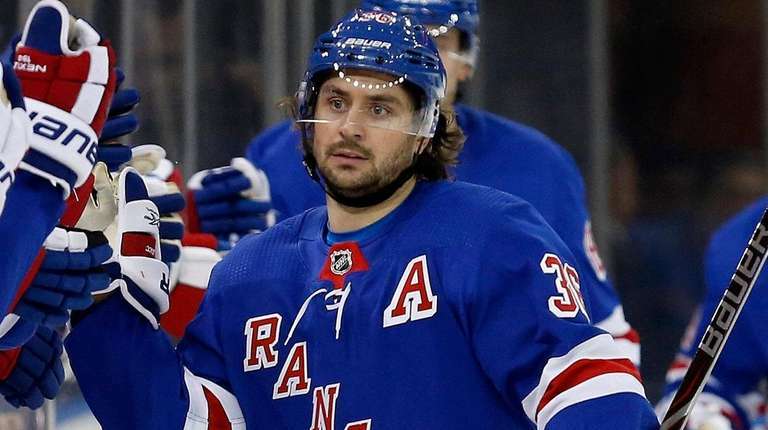 GREENBURGH, N.Y. – Mats Zuccarello will miss the Rangers’ two-day road trip with a groin strain, coach David Quinn announced on Thursday. Zuccarello, who has three goals and seven assists in 15 games, played 14:53 in the Rangers’ 5-3 victory over Montreal on Tuesday. The Rangers, who have won four in a row, visit Detroit on Friday and Columbus on Saturday. Quinn said Zuccarello is day-to-day and would be re-evaluated when the team returns to New York. Pavel Buchnevich skated in practice in Zuccarello’s spot with Vladislav Namestnikov and Mika Zibanejad. Also on the ice for his first practice with the team was 20-year-old Lias Andersson, who was called up on Tuesday and went right into the lineup against the Canadiens in place of the injured Brett Howden. Howden’s absence will be short, however. He, too, practiced on Thursday, and should play Friday after escaping a major injury when he went face first into the backboards after a collision and left Sunday’s game against Buffalo. Like Andersson, Howden is 20. Filip Chytil, who practiced on a line with Andersson and Vinni Lettieri, is 19. So youth will be served when the Rangers face the Red Wings. Andersson will be playing in his ninth NHL game. The Rangers were in the process of debating whether to call him up from Hartford when Howden went down, so the decision was made much easier – and was a surprise to Andersson, who was sleeping on Tuesday morning when he was roused and told to get to the Garden. Quinn is intrigued by Andersson, who was selected by the Rangers in the first round (seventh overall) in the 2017 draft. The Swede played 12:17 on Tuesday and had three shots and four penalty minutes. Notes & quotes: Quinn said Henrik Lundqvist would start Friday and he plans to start Alexandar Georgiev on Saturday. “That’s my inkling right now,” Quinn said. “But I’m a day-to-day guy. I know I’ve got a plan in mind, but that could change.” . . . Boo Nieves was sent to Hartford . . . Jesper Fast (maintenance day) did not practice.